Follow the basic Victoria sandwich recipe, replacing 25ml milk with a pinch of saffron strands soaked in 25ml hot water for 5 minutes. Stir in the remaining 50ml milk and add to the cake mixture with the flour in Step 1. To decorate, spread ½ x 325g jar Waitrose Luxury Lemon Curd over one of the cooled cakes and sandwich together with the other cake. Stir 3 teaspoons lemon juice into 100g icing sugar to make a fairly thick, smooth paste. Spread over the top of the cake, then allow to set for 5-10 minutes. 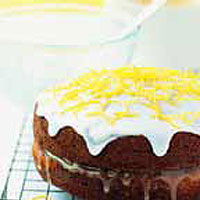 Pare the zest of 2 lemons using a zester and sprinkle over the top of the cake. This cake can be kept for up to 4 days in the fridge.